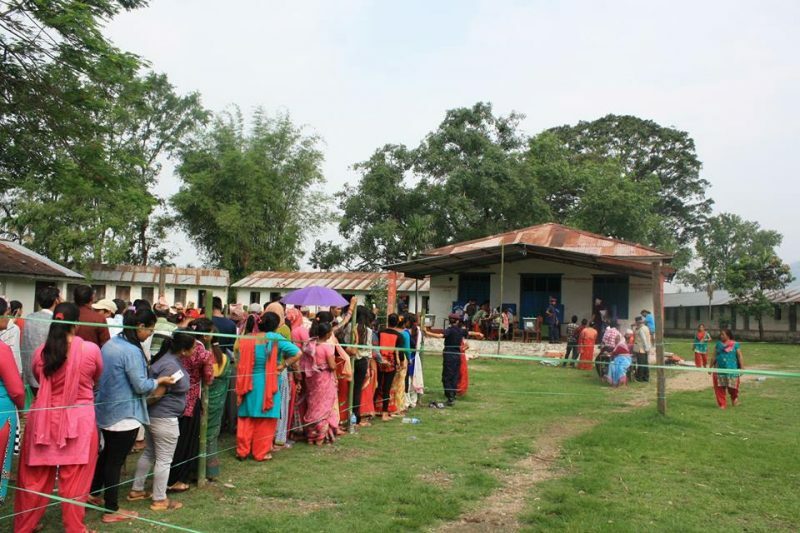 Voters queuing to cast their votes at a local polling booth in Kamalamai Municipality, Sindhuli district during the first phase of local elections. Photo by Saurav Dhakal. Used with permission. After 20 years, Nepal held the first phase of local elections on May 14, 2017 in three provinces. The second phase of the elections for the remaining four provinces has been rescheduled on June 23, 2017. But counting is criticized for being slow. It took the Election Commission 14 days before announcing the new mayor of Kathmandu Metropolitan City, the country's capital. Despite the aggressive campaign of new parties to grab power at the local level, the final results of the first phase of the local polls have gone in favour of the three major parties – Communist Party of Nepal (United Marxist-Leninist), Nepali Congress and Communist Party of Nepal (Maoist – Centre). It took Nepal 20 years before it was able to conduct the local polls because of a Maoist insurgency in 2002 and the decision of major parties to boycott the 2006 local polls. The 2017 local polls, which produced a turnout of over 70 percent, saw Nepalis choosing their local representatives for the first time in a federal set-up. With the promulgation of new constitution in 2015, a three tier governance system was introduced namely national, provincial and local levels of governance. Cartoonist Abin Shrestha posted a cartoon that says: Seems “metro” will arrive earlier than “mayor”, hinting at the parties’ promises to bring metro rail to Kathmandu. Despite the slow counting, the first phase of local elections has been successful in electing women candidates as mayors, chiefs, deputy mayors, and deputy chiefs in municipalities and village councils. Four municipalities and eight village councils have chosen women candidates as their heads. Women have emerged victorious in 263 municipalities and village councils as deputy mayors and deputy chiefs. Likewise, 13,000 women including 6,500 belonging to Dalit (so-called untouchable) community have been elected to ward committees. Even the Kathmanduites voted in large numbers for 21-year old Ranju Darshana. However, most of the seats were won by the same three big parties – Communist Party of Nepal (United Marxist-Leninist), Nepali Congress and Communist Party of Nepal (Maoist – Centre) although there are almost a hundred political parties in Nepal. The social media users compared it to the habit of Nepalis choosing momos and chow mein despite glancing through restaurant menus for a long time. The public looked at the menu, looked for all, thought what to eat for a long time. At the end chose momos and chow mien. Update June 1, 2017: The Nepalese Deputy Prime Minister and Minister for Home Affairs Bimalendra Nidhi has said that the second phase of the elections are set to be rescheduled for June 28 and that the Cabinet would take a decision to this effect soon.